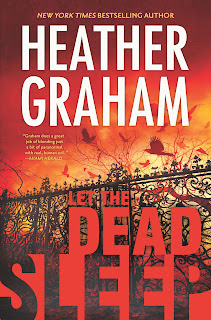 I'm a long-time fan of Heather Graham, and while this isn't my #1 favorite of hers, LET THE DEAD SLEEP is an intriguing, fun read. Heather delivers the eerie paranormal twists that she is known for, while creating a plot that is creepy and populated by quirky characters. In this paranormal thriller, Heather takes a somewhat ordinary object and turns it into an element of terror. She never fails to deliver a great read. So if you're looking for pure entertainment, check this one out. PS: I received a free ARC in exchange for an honest review. thanks for publishing this book.this story is adventurer able and enjoy able.